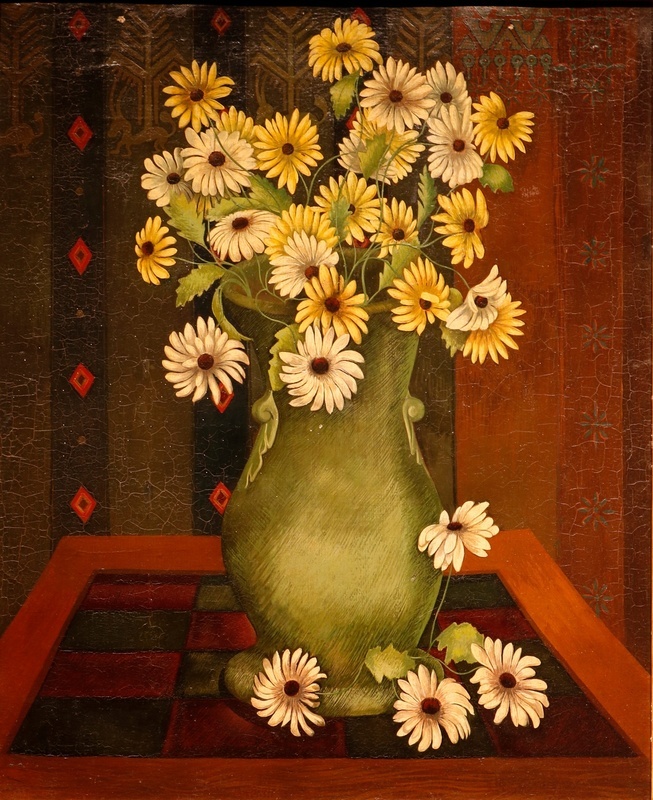 The pleasing daisies in a vase at center may give this painting its name, so artfully have they been created and arranged. If so, their status as humble field flowers plays against the ornate, patterned background and checkerboard table. Beautifully harmonized colors create a self-enclosed space. Another interpretation of Pandolfini’s title might observe that everything here is a sort of Trompe-l'œil with painted surfaces. About the Artist: Born in Palermo, Italy, Pandolfini immigrated to the US in 1912 and worked as an engraver in his father’s jewelry shop. Along with NDG artist James Guy, Pandolfini was among the leadership of the Unemployed Artists Group of the John Reed Club—later to become the Artists Union. His work was exhibited in places like the Corcoran Gallery (1934); the Museum of Modern Art (1936, 1938); the Pennsylvania State Museum (1939). Underneath his NDG still life painting is a body of work directly grappling with the economic injustice of his times, as a few titles will attest: “Unemployed” (1932-37); “The Pay Line” (1938); “Night Will Fall and the Homeless Shall Be Without Shelter” (1937); and “Strafing Maneuvers” (1941). He taught painting at the Brooklyn Museum. 9 more images at FAP. Pandolfini, Joseph Paul, 1906-1987, “Paper Bouquet,” OpenValley, accessed April 25, 2019, https://openvalley.org/items/show/1203.